« It doesn’t only rain at night! 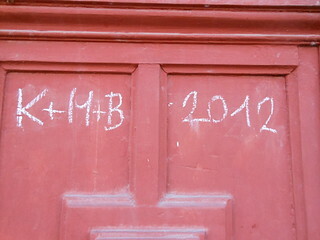 Many houses in the Czech Republic, Poland and Slovakia bear this inscription in chalk on their front door. What gives? It appears that this reflects the way Catholics in these areas celebrate the Epiphany. K, M & B are the intials of the three wise men (Kaspar, Melchior and Balthasar for those who weren’t paying attention in Sunday School). Enthusiastic Christians (of which there are many in these parts) visit the church after Christmas with a gold ring, incense and amber (representing the Magi’s gifts) and some chalk to be blessed. The blessed chalk is then used to inscribe doors to protect against various ill adventures. This entry was posted on 26 July 2012 at 5:20 pm and is filed under Czech Republic. You can follow any responses to this entry through the RSS 2.0 feed. You can leave a response, or trackback from your own site.